With the magnet is on the outside, it's easy to see the science behind these eddy tubes. The Racing Rings feature three 12" rods with a 1/2" dia. The set includes one made of copper, aluminum, and PVC each. 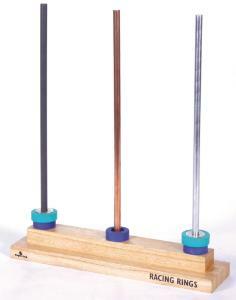 When a Neodymium ring magnet is dropped down the PVC rod, it falls unobstructed. When the rings are sent down either of the metal rods, they experience a slower fall. The two metal rods create an induced magnetic field that adds resistance to the rings’ travel. Since the metals are different, they fall at different rates. For extra fun, place the metal rods in a freezer for an hour, so the rings fall at an 18—27% slower rate. Ordering information: This kit includes a wooden base; one PVC, copper, and aluminum rod, respectively; two neodymium ring magnets; and a demonstration guide.